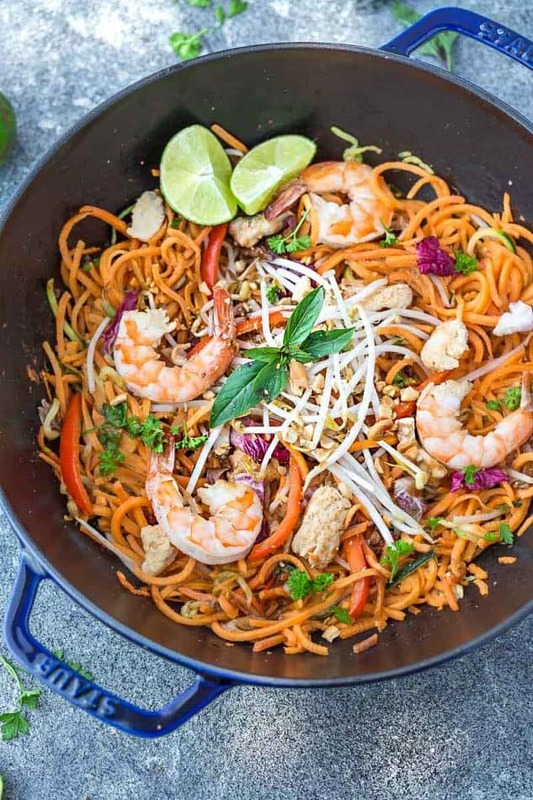 Pad Thai Sweet Potato Noodles is the perfect easy 30 minute one pan meal! 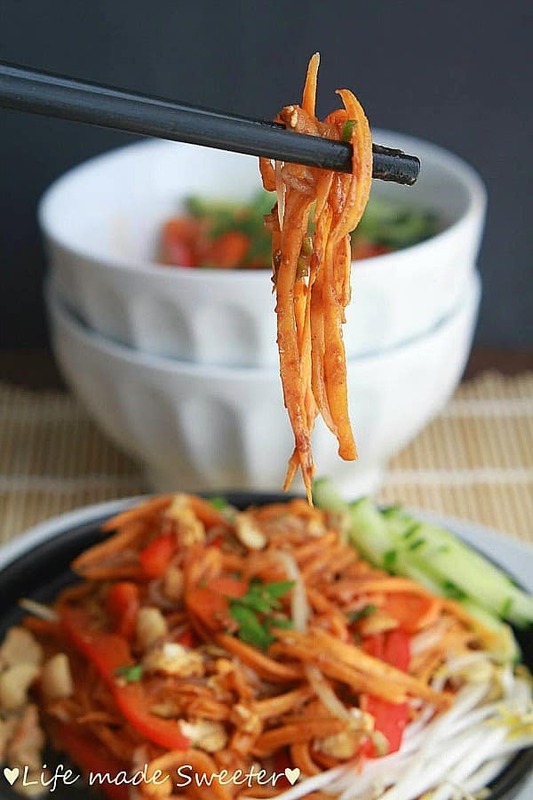 Best of all, this recipe is packed with all the traditional flavors of Pad Thai you love in a grain free and meatless version using spiralized sweet potato “noodles”. With video! 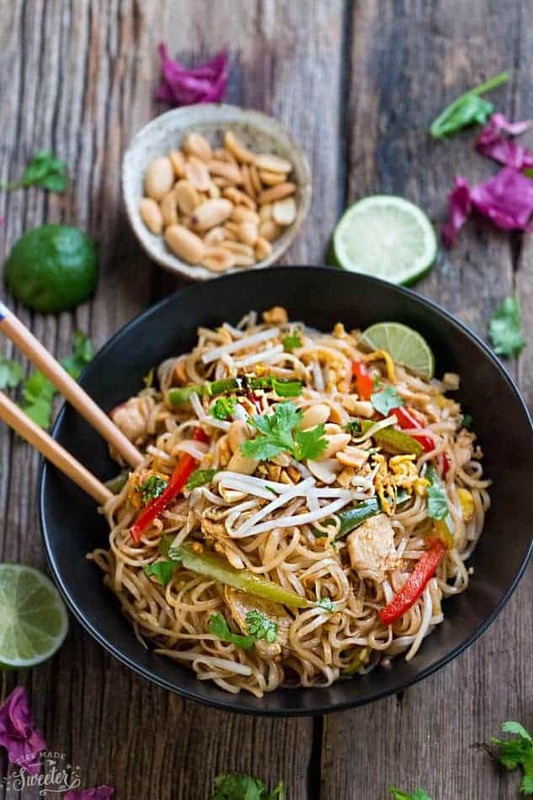 One of our favorite take-out dishes I recreate most often is Pad Thai. I love making it at home every chance I get. Not only is it healthier than our local Thai restaurant. Making it at home means I get to customize it with the ingredients we have on hand. 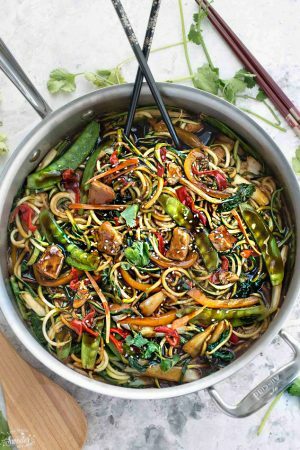 For this lower carb version, I swapped out the traditional rice noodles for spiralized sweet potato noodles instead. 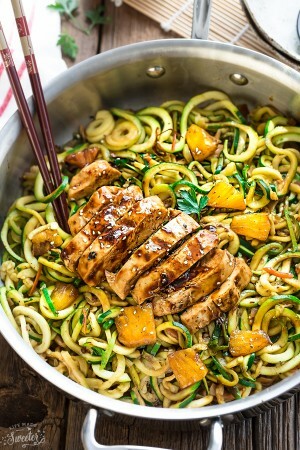 It’s super easy to make and all you need is a julienne peeler if you don’t have a fancy spiralizer. The hubs is usually not too optimistic when he knows I’m trying to get him to eat more veggies. But this time he was actually on board with this grain-free version of this restaurant favorite. 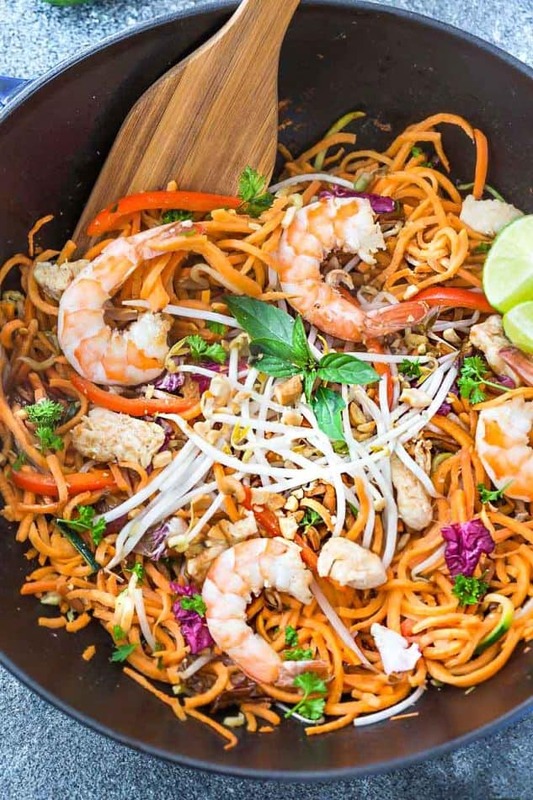 He seriously loved this Sweet Potato Pad Thai Noodles and you can bet it’s going on our regular dinner rotation. This starts off with the familiar sweet, spicy, salty and sour flavor-bomb sauce. Next come the veggies. I tossed in some carrots, bell pepper, red cabbage, bean sprouts, cilantro and chopped peanuts. The best part about making this at home is that you can use any veggies or nuts you like. If you’re looking for a meatless version, feel free to leave out the chicken and shrimp. 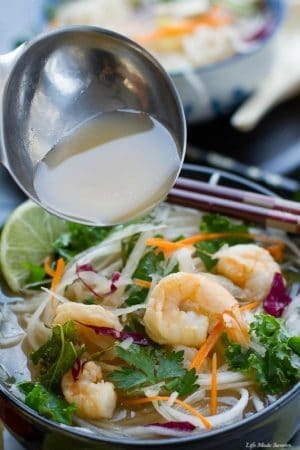 Pad Thai sauce is my favorite and this recipe makes a generous amount to coat the noodles with still enough leftover. Feel free to cut down the ratio if you prefer less sauce. 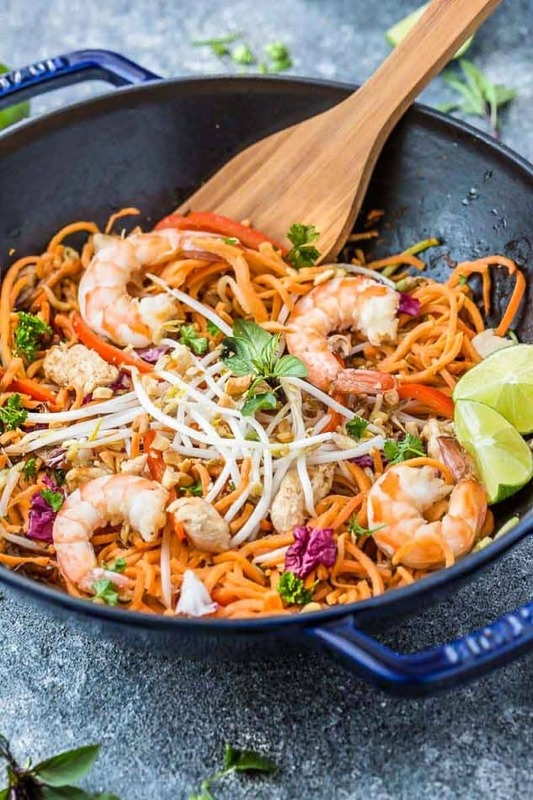 All the traditional flavors of Pad Thai you love in a grain free and meatless version using sweet potato "noodles". Heat the oil in a large wok or non-stick skillet over medium-high heat. Add the chicken and cook until mostly cooked through (about 2-3 minutes). Add shrimp and continue stir-frying 2-3 more minutes, or until shrimp are pink and plump. Transfer to a plate and set aside. Add remaining oil and sweet potato noodles. Cook for 3-4 minutes, until softened. Add the garlic, ginger and shallots and cook for about 30 seconds, until fragrant. Add the grated carrots and bell pepper and cook for 1-2 minutes, until tender crisp. Push all the ingredients over to one side of the pan. Pour the beaten egg and scramble directly in the skillet. Squeeze in juice from lime wedge and adjust seasoning by adding some salt, black pepper, fish sauce, (tomato paste - if using) and chili paste. 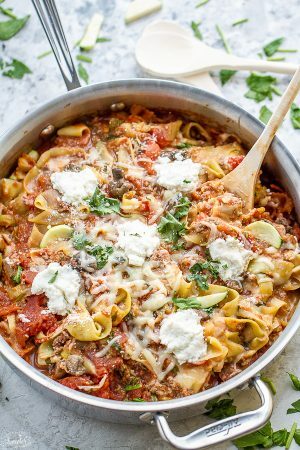 * This makes a generous amount of sauce to coat the noodles and have a little bit leftover but feel free to cut the ratio down if you prefer less sauce.